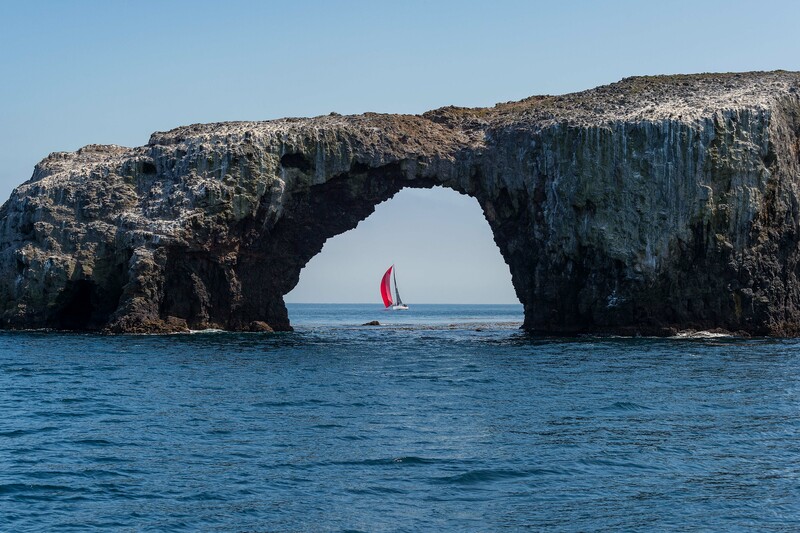 Arch Rock next to Anacapa Island last weekend. It was dope the sailboat appeared at the exact right moment. Photo courtesy Steve Hymon. 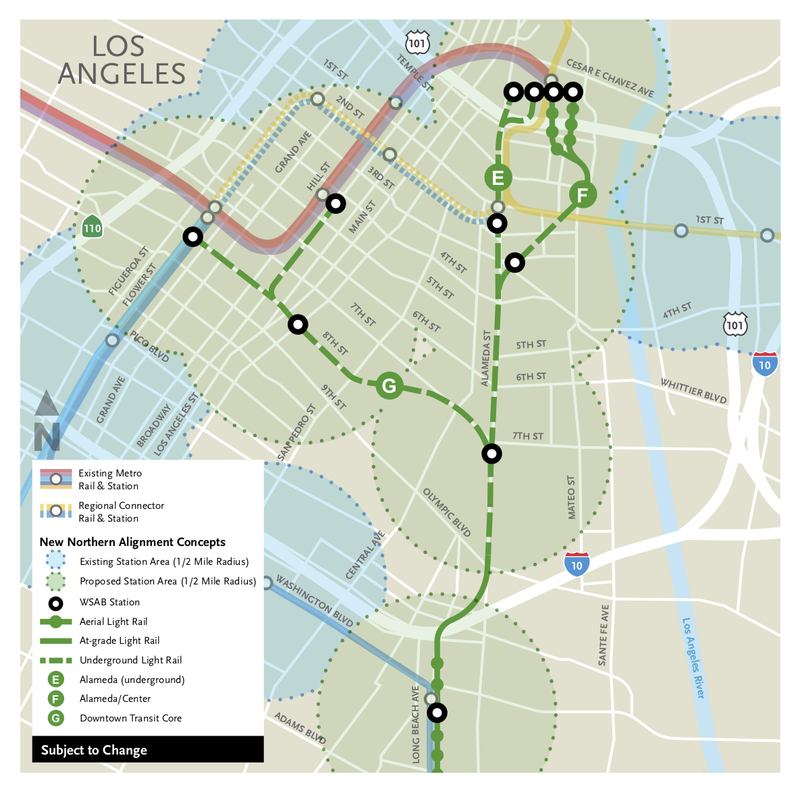 Good coverage of the Metro Board’s selection on Thursday of two routes on the northern end of the Artesia-to-DTLA light rail line for further study. On the map above, the routes are E and G. Those two routes — along with F, which was eliminated by the Board — were the highest scoring in terms of mobility improvements. The two remaining routes, I think, are pretty interesting — and different. G would take riders from Southeast L.A. County straight to the downtown core whereas E would take riders directly to the largest transit hub in So Cal. Both offer a connection to the Blue Line and would serve the area around 7th and Alameda, where many new developments are proposed and the Row sits. Reporter Matt Tinoco also looks at public private partnerships and other issues involving the project. Good local reporting. More good local/consumer journalism. LAT columnist David Lazarus was cited for driving across a Bay Area bridge while reading on his couch in Los Angeles. What happened? The SUV crossing the bridge had a very similar license plate and looked a lot like Lazarus’ SUV. The computers/Skynet then goofed and mailed him the citation. That means almost three dozen people are receiving bogus notices every day saying they have to pay a fine. Metro ExpressLanes, which operates FasTrak in Los Angeles County, says it figures only about two erroneous notices go out daily, which might speak to the agency’s more efficient operation or, more likely, the possibility that L.A. drivers are so accustomed to traffic violations they’ll pay any citation that comes their way. “Nine times out of 10 it’s a misreading of the license plate,” said Rick Jager, a Metro spokesman. Overall, the folks in the Bay Area said about two-tenths of one percent (1,000 of 368,600) citations issued last month were mistakes. The upside of automation, of course, is that motorists don’t have to stop at toll booths. The downside is that automation isn’t perfect, even if the rate of mistakes is overall pretty low. The BART website says the project was estimated to cost $1.6 billion to extend the tracks for 5.5 miles down the middle of the 580 freeway to the new station. A new end-of-line train facility was also part of the project. Well, that explains why the “T” is suffering and the “T” ridership is down. At least he’s honest that he’s not focusing on the “T”. Yeah I have to agree, it’s a bit eyebrow raising. This is going to get real interesting when the automated enforcement for occupancy happens on the Express Lanes. I could easily see it miss smaller adults or children in the back seat, while possibly counting a large dog as a person. Great idea! But again this is not the priority transit project right now!! Please use the money to improve the existing rail and speed up those projects that is currently under construction first. Projects like grade separation of the blue/ expo line on Flower street, red line extension on Vermont corridor, Crenshaw/LAX Line north extension to Hollywood, and Sepulveda Pass Transit Corridor should be the priority projects right now. Downloaded the Preliminary Alternative Alignments. Majority of options C-H south of Slauson are at grade => less expensive. For budgetary reasons, WSAB could have Phase A and Phase II. Phase A Pioneer Slauson. Phase II when the meetings cease. Major expenses in Phase A would be the 105 widening and the yard in Bellflower.